The results are in and the numbers are compelling. 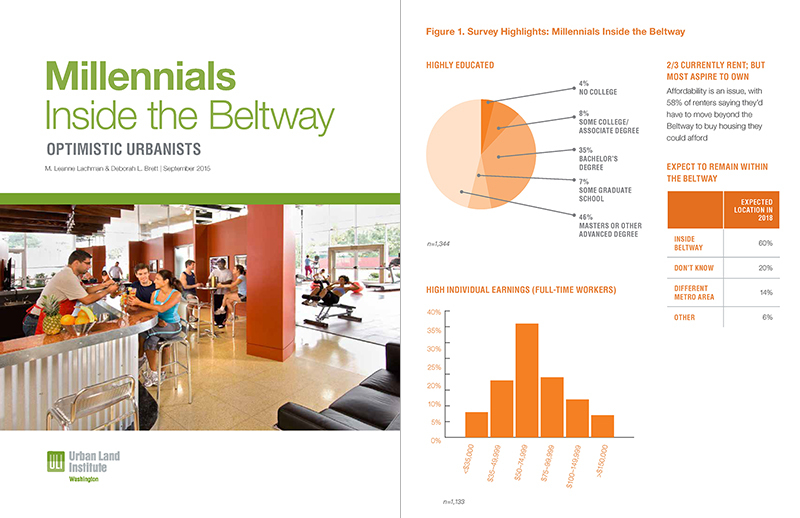 ULI Washington and Hickok Cole Architects presents the results of an in-depth survey on the lifestyle choices and preferences of Millennials, also known as Gen-Y, inside the beltway. Yolanda Cole, Senior Principal and ULI Washington Chair of Mission Advancement led ULI Washington in its survey of 1,344 DC Metro Millennials. Why a Millennial Survey? : Washington, DC has the 6th highest Millennial population in the country and this cohort currently makes up 38% of the DC area workforce. The ULI study was conducted to provide business, the real estate industry and local jurisdictions with data to help them craft strategies, policies to accommodate this population as they age and for families. Process: This was a “survey of the willing,” rather than a representative sampling of Gen Yers living inside the Beltway. Qualtrics, a survey research firm, generated 693 responses from people born in 1978-1995 and living within specified zip codes inside the Beltway. Another 651 survey completions were originated by ULI’s public outreach efforts through social media; local blogs; news articles; apartment owners and developers who made tenants aware of the survey; younger members of ULI, NAIOP, and other industry organizations. 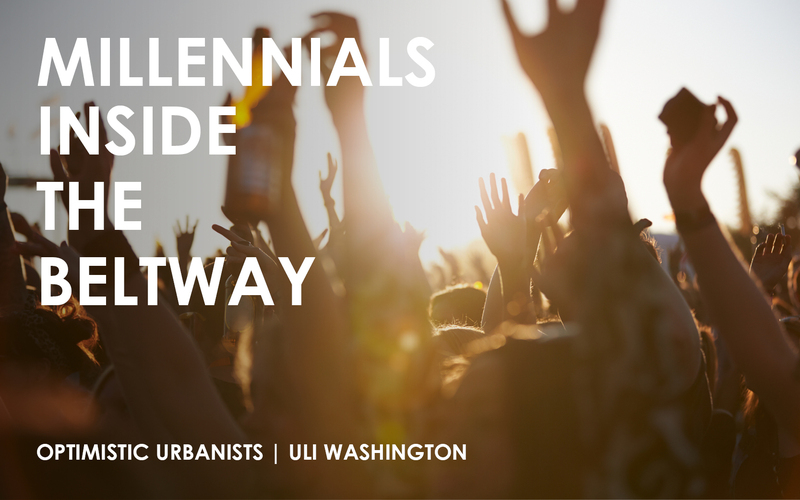 Millennials living inside the Beltway express a great deal of satisfaction with their housing units, their neighborhoods, public services including parks and transit, and convenience retail stores. They also demonstrate ongoing resolve to remain within the Beltway. One limiting factor is housing affordability. 25% of the renters surveyed have roommates, though 50% of them would prefer to be living alone. When asked whether they could find the type and size of housing unit they want, at a price they can afford, inside the Beltway, 58% of the renters say no, they would have to move further out. The high cost of housing in the District and the close-in suburbs is the most critical factor limiting the potential for Millennials to stay. Their desire for homeownership is strong; but even well-educated, hard-working, 30-somethings have finite resources. While the majority of Millennials surveyed are currently satisfied, results about future desires indicate that 75% of the surveyed population is willing to start families inside the Beltway but is unsure how to make this wish become a reality. What’s Next? : We have presented our findings to developers, DMPED, Department of Planning and continue to champion discussions about policy change and housing product innovation which will help retain DC’s Millennial population as they start families.